So many people feel isolated and ashamed of who they are. Society trains us to believe we are never enough, and we build up walls of exclusion and fear. So at V&M we try to un-program ourselves and practice radical hospitality. 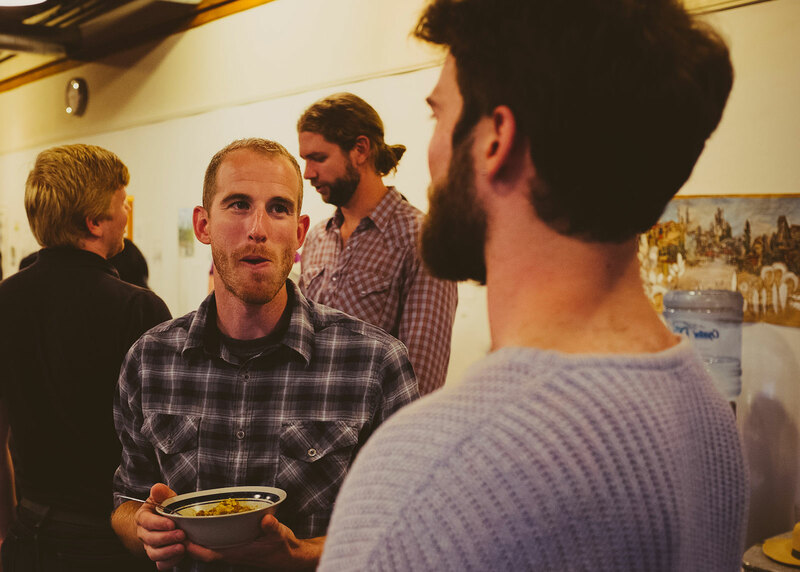 Radical hospitality is about learning how to receive with gratitude the gifts and stories of the other, while respectfully and unashamedly offering others our gifts and stories as well. Our vision is to create a common culture rooted in grace, that is based on deep listening, mutual care, and commitment to loving people, especially those most often left out and underappreciated. The Hillman City Collaboratory, on the corner of Rainier & Orcas, is where we meet for Celebrations and is the axis around which our community revolves. This community hub is where V&M gathers and where we deepen relationships with our neighbors and with dozens of other organizations working for the common good. The Collab was born in June 2013, when V&M partnered with an artist collective, Community Arts Create to start a social change incubator and community hub. V&M is the fiscal sponsor and general underwriter, but we share the tasks of vision-setting and operations with many other groups and people not affiliated with V&M. This is one of the ways we live out our commitment to being a church that is integrated, not isolated, in our broader community. When small groups build trust and supportive common vision, they can become a place of profound life transformation. All of our groups are rooted in the quest for deep relationships and spiritual maturity. We currently have 7 ongoing Small Groups that meet regularly. Each group has a pair of trained co-facilitators that help the group (7-12 people) create a container where folks can be authentic together. One of the ways we support people going through big changes, is through rituals meant to assist them in making emotional, spiritual, and physical shifts. For ceremonies like marriages, baptisms, and funerals, we sit down with the people involved to talk through the purpose, and work with them to co-create ceremonies that are rich in meaning and value. Other rituals we celebrate include our annual All Souls Day gathering where people can speak about those they have loved and lost, weekly Communion at the 11am Celebration where we affirm that we are loved without condition, and the Women’s Circle solstice and equinox bonfires where participants reflect on the past season and set intentions for the next in a supportive, spiritually vital environment. Valley and Mountain is connected to the United Methodist Church (UMC). We are grateful that the UMC helped us get started in the beginning, and that it continues to provide a network for mutual support, solidarity, and accountability. One of the first questions we get from newcomers to V&M is "Do I have to be a Methodist, or to want to be a Methodist, to be part of Valley & Mountain?" The short answer is: "No, V&M is all about radical hospitality, and you don't have to have any label, including Methodist, to be fully included at V&M. We have people with all sorts of labels and people who don't identify with any religious label, and most of our folks don't describe themselves as Methodists." People are still curious what the UMC is about, and here's a very brief snapshot of the history. In the 1700's an innovative Christian movement centered on grace (grace = love without condition) exploded across Britain and North America. The small band of founders, led by John Wesley, were motivated by a desire for a passionate, justice-oriented spirituality that was rooted in authentic and vulnerable community bonds. They saw so much artificiality, apathy, and acceptance of social injustice in the institutional church, so they organized small groups of people who desired a deep intimacy with God and others, and who were committed to participating in Jesus’ vision of a just and loving society. The movement challenged the aristocratic status quo, started free schools for the poor, allied itself with the emerging working class, inspired fervent abolitionists (including William Wilberforce), and developed vibrant prison ministries. This movement is the direct ancestor of the modern United Methodist Church, which is still rooted in grace and focused on the twin pillars of (1) developing a vibrant personal spiritual life and (2) working for social and economic justice. Today the UMC is organized by regional networks called "annual conferences” (because all member churches gather for an annual conference). Valley & Mountain is a member of the Pacific Northwest Annual Conference of The United Methodist Church. We love our neighborhood! We are committed to being part of the flourishing of our home, starting on the corner of Rainier Avenue and Orcas Street, and beyond to the Rainier Valley, to Seattle, to the Puget Sound, and to our world. We acknowledge that we meet on land stolen from the Duwamish people, and seek to learn the history and respect the culture of those who first tended to this land. We are a new congregation, and honor those people who over the decades have helped make Hillman City and South Seattle into the haven for marginalized peoples that it has historically been. We work here with a posture of humility, not seeking to fix anything in our neighborhood, but to add what we can to it’s vibrant and inclusive life. Many, perhaps most, of our V&M co-creators live within walking distance of where we meet, though we welcome you no matter where you live.